The Mother Daughter Book Club meeting for this book was held January 18, 2018, at 6:30 in the Community Room. How can a fairy’s blessing be such a curse? At her birth, Ella of Frell was the unfortunate recipient of a foolish fairy’s gift — the “gift” of obedience. Ella must obey any order given to her, whether it’s hopping on one foot for a day and a half, or chopping off her own head! But strong-willed Ella does not tamely accept her fate. 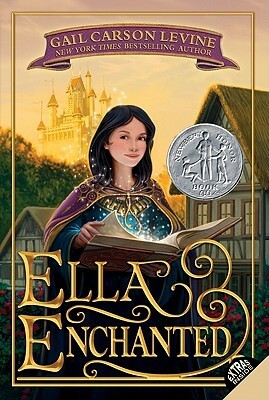 Against a bold backdrop of princes, ogres, giants, wicked stepsisters, and fairy godmothers, Ella goes on a quest to break the curse — once and for all.